See our other Native American and Southwestern. 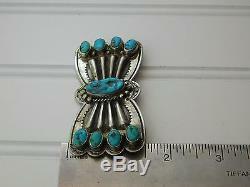 Is This Vintage Classic Old Fred Harvey Tourist Era NAVAJO Pin. 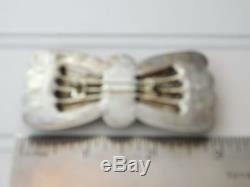 Stamped and Repousse Sterling to Coin Silver Pin Brooch. Pin Set with Eight Genuine Turquoise Cabs Surrounding One Larger Turquoise Gem. Also adorn w/ Sterling Pearls and Twisted Rope. 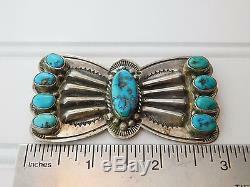 Brooch measures 3 inches long and 1 1/2 inch wide. Engraved'CHA-PI' (Pi symbol) unknown. Total weight 33.5 grams. Please Note: Photos are great for checking condition but. Represent size unless the photo was taken on a one inch grid, ruler or coin. Stunning Addition to Your Special Jewelry Collection. Thank you for your time. 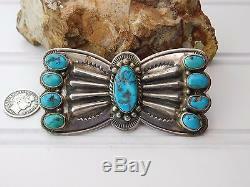 The item "Vtg Old Fred Harvey Era TURQUOISE Repousse Coin Sterling Silver Butterfly Pin" is in sale since Saturday, May 27, 2017.